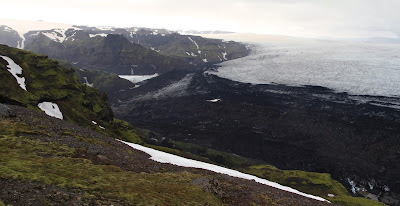 Duration: About 7.5 hours, 12:20pm - 7:45 pm with a break for lunch overlooking Huldujökull Glacier. 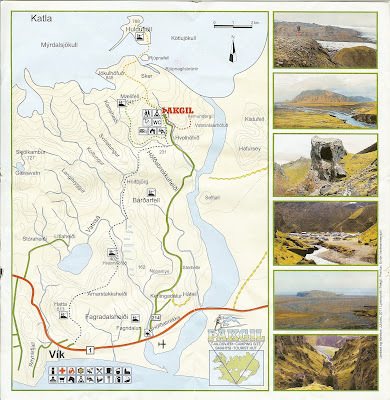 When we pulled into Þakgil on a pleasant Friday morning, we were expecting an easy hike. 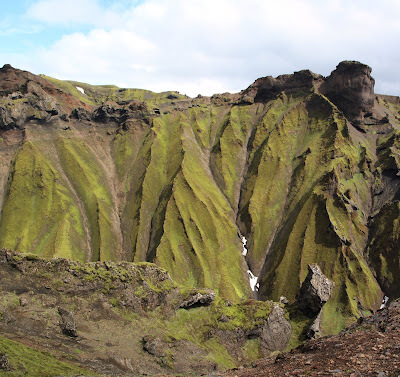 When we left, we had unexpectedly completed a hike that was more strenuous than the previous day’s Fimmvörðuháls Pass, Þórsmörk to Skógarfoss Hike, and in some ways more frightening. We checked in at the information “shack” (marked with a blue “i”). A man (manning the shack?) warned us about going on the yellow route. He said we could lose sight of the markers in the snow. It had been a late spring/summer and the trails were not yet ready to use – at least that’s what I remember. He suggested walking part of the yellow route, doubling back and visiting part of the red route, and then returning back to the camp by backtracking on the yellow route. So we started on the yellow route, which was basically a steep jeep road for vehicles to get onto the glacier – at least at the beginning. After a while, we climbed higher and donned more layers of clothing. We found ourselves in snow and walking along the edge of the gaping hole, across which was the Huldujökull Glacier (oops, did it again). We took lunch on a rocky area free of snow. While we ate, we heard and saw pieces of the glacier edge dropping into the pit. Pretty awesome. After lunch, we decided to continue around the yellow route clockwise, ignoring the advice not to do this. We did lose our way a bit but after some maps checks and thinking about the topography of the land, we got back on track and soon were soon out of the snow and seeing markers regularly. 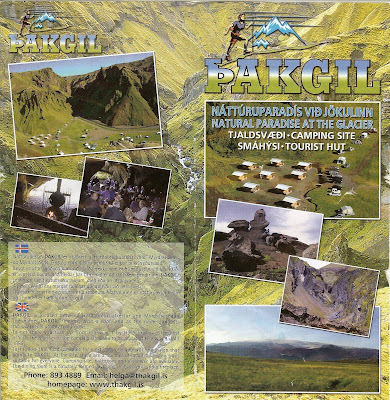 The markers on the Þakgil trails are short, colored poles. In many cases (at least at many places on the yellow route) there was no obvious footpath from marker to marker. We just took the easiest and least destructive path we could find. 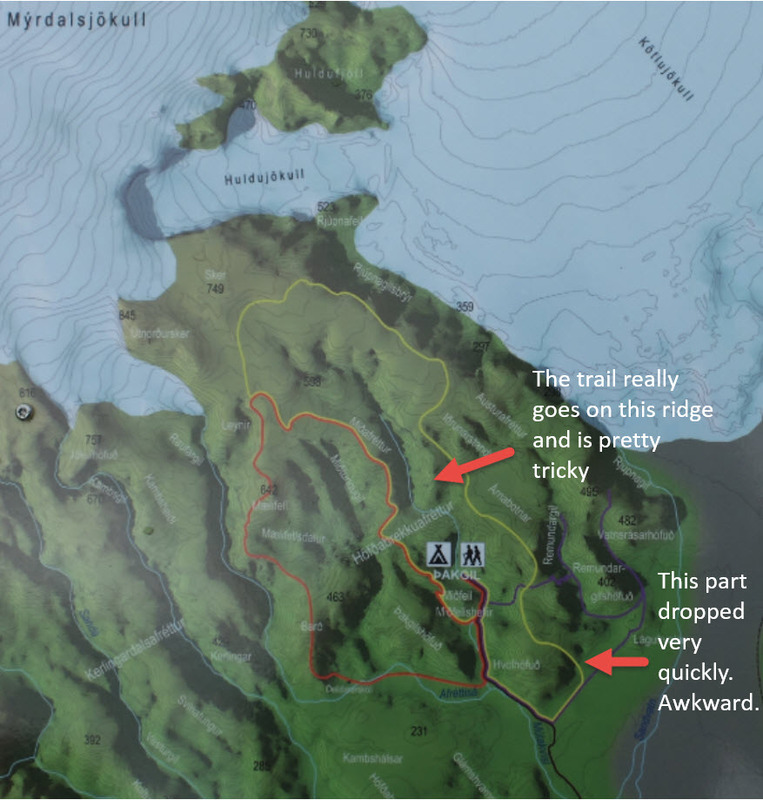 It’s as if someone had come up, laid out the trail with markers and then nobody hiked it. At one point on the yellow route, we hit a part of the trail on a ridge that was dangerous. There was a steep drop off on one side, and a steep scree slope on the other where the trail was. We could see a yellow marker in the distance, but as we started toward it we started to slide. And down we came. We got torn up a bit on the sharp rocks. Luckily, just after that tough part, there were big springy moss clumps to wipe the blood off our hands. 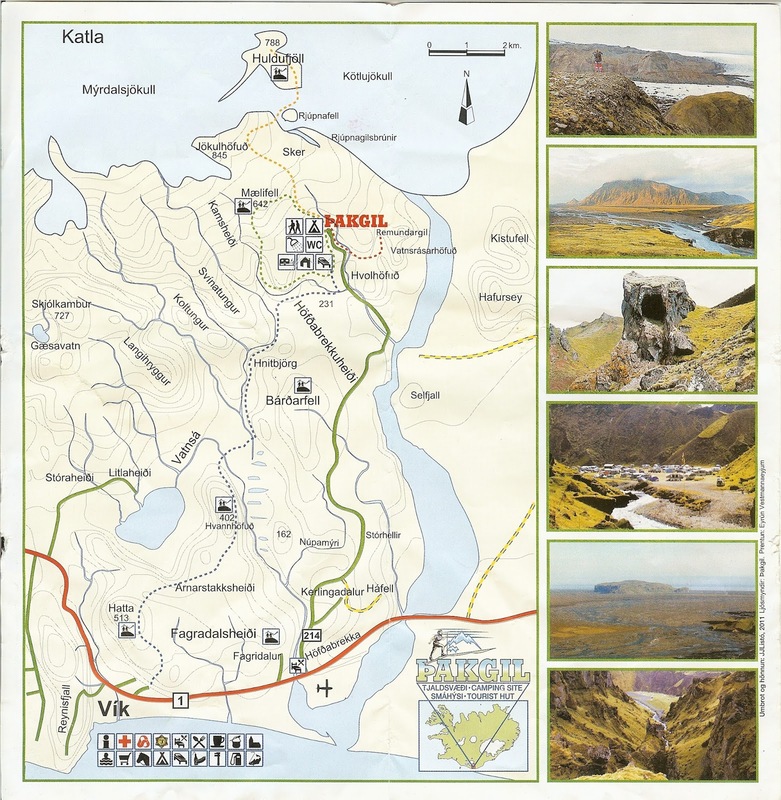 The incident generated in us a healthy respect for Icelandic trails and the difference between them and our relatively comfortable and easy Northwest trails. Well, at least the ones we go on. There was one further surprise on the yellow route. As we got toward the end, it dropped quickly down a steep slope. We managed to get to down it thanks to the fact that it was completely cushioned with moss. Overall, we were amazed that this was considered a trail at all. Call us pampered hikers. On the upside, the views on this hike were spectacular. We had a mix of skies and weather leading to great photos and vivid memories. The scenery went from brilliant whites of glacial snow, to jet black sands, to the fluorescent greens of moss. In the distance, to the east, Mýrdalssandur is always visible. It is an outwash plain or sandur from Mýrdalsjökull on the south coast of Iceland. Left: Meadow with Cardamine pratensis – Cuckoo Flower; Center and Right: Walking Up to the Glacier. More info on plants at Selected Plants from Our Iceland Trip. Left: View on Part of Hike Before Reaching the Glacier; Center: After the Glacier - View Across the “Canyon” to the Jeep Trail We Took Up to the Glacier; Right: A Tricky Part on the Trail. Hi, thanks for this info. As inexperienced hikers, would you say the markers are obvious and we could follow the path, or should we have more experience to make it? Thanks! It's a judgment call. I think the area is so special it would be a pity to miss it. You could do what the "ranger" suggested to us: do the first part of the yellow route to get to see the glacier which is awesome, double back and visit part of the red route, and then return back to the camp by backtracking on the yellow route. The first part of the yellow route is easy so no worries there and you'll still get great views. Even if you just walked up the first part of the yellow route and back, that would get you a pretty good sense of the area. If you decide to go, check in with the information booth at the campsite before starting to hike, and see what they suggest.